Teach your students to not just find an answer, but to find the best information that meets the needs of their question. Train students to always evaluate their sources, encourage them to question and verify everything. Technology makes it too easy to create and spread false or misleading information. Just ask my 4th graders about the tree octopus, or my 5th graders about Dog Island. Within minutes the students wanted to save the tree octopus from extinction and send their dogs on vacation to Dog Island. That excitement waned as they looked closely at the details. Little clues like grainy pictures of stuffed animals, strange copyright dates, nonexistent locations, or photos that didn't match descriptions in the text helped students to see that these sites were indeed bogus. 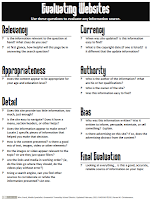 A tool like RADCAB can help guide student questions as they decide if an information source is trustworthy and appropriate to their information need. 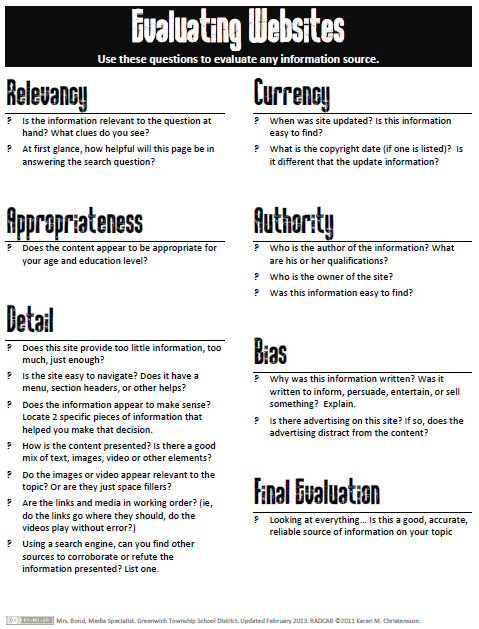 RADCAB breaks the evaluation process into 6 categories, testing the relevancy, appropriateness, detail, currency, authority and bias of an information source. As experienced researchers we ask these questions without thinking. But our students are too trusting, too willing to believe what they read. To complicate matters, they are still learning what good information looks like. Demonstrate how you answer these questions when sharing information sources with students, focusing on one or several categories. Encourage students to explain why they think a source is reliable.